Village Volunteer Ashby Village member Cecelia Hurwich is a woman with a message: Despite its challenges, later life can be filled with inner richness and vitality. At 95, she is actively engaged socially, culturally, and politically and you would know it to look at her. Dressed in vibrant hues of orange and red, favorite colors reverberating throughout her home¬, she greeted me with a big smile. “I am a playful, joyful person,” she announced, setting the tone for lively and thought-provoking conversation. It is not surprising that Cecilia and her life partner of many years, Don Ross, were early supporters of Ashby Village’s pioneering efforts to facilitate long-term ties to home and community. “My home is an anchor. It represents stability, safety, and a place of continuous nurturing. It expresses who I am. It’s aesthetics and bright colors offer both stimulation and tranquility,” Cecelia says of her Elmwood house, purchased in 1956 with the aid of a Veterans’ Assistance loan. Cecelia speaks with gratitude for assistance with technology and home repair, provided by Ashby Village volunteers. Her primary engagement with Ashby Village, however, has been as “a place to be introduced to new ideas.” She participated in tai chi classes “to reconnect mind, body, and spirit.” The “Walking with Poles Class” garnered her vigorous praise, not only because it makes it possible for members to stay physically active, but also because it provides an opportunity for members to experience nature together. Cecelia did not set out to write another “how to grow old” book. Instead, her autobiography, 92 and Dancing, blends her research with the story of a life guided by an appetite for meaning and new experiences. It is a life grounded in the East Bay and extending to global travel, service as a WAVE in World War II, climbing Mount Everest, a life-long love of the wilderness, and commitment to social and environmental issues. Cecelia’s passion for philanthropy and social activism is an extension of her willingness to engage. As she puts it, “We need to show up for each other. Life has meaning beyond me and mine.” She has served for several years on the board of the Arkay Foundation, a funder of Ashby Village and other initiatives in social innovation, economic and social justice, and environmental protection. Active in Great Old Broads for Wilderness, she joins activists who bring media attention to wilderness areas threatened by pollution and development. In her light-filled living room, warmed by colorful pictures painted by a friend and a lifetime’s collection of books and artifacts, Ashby Village member Thelma Elkins sits down with volunteer Julie to talk about their history together. The two women seem as if they’ve known each for years, but surprisingly, it’s been just six months since they first met. As Thelma tells it, one of her granddaughters, then a high school student, “… called one day and said, ‘Grandma, I’m writing a senior paper, and I need a mentor. Will you be my mentor?’ So I said, sure. It turns out she wanted to write it on learning Yiddish, of which she knows not one word. But I’m the last repository of Yiddish; it was my first language growing up.” Eager to help her granddaughter, Thelma tried without success to find someone to translate the Yiddish letters into English. Julie overheard Thelma talking on the phone seeking a Yiddish translator, and spoke up to say she might be able to help. Julie immediately sent out a couple of emails to a friend and a cousin who knew Yiddish. Abraham Cahan, the subject of the book Julie’s father translated, was the publisher of the influential Jewish Daily Forward in New York, and a leader in the New York Jewish community around the turn of the century. Julie’s father had even worked for that newspaper. (When Thelma found out about the book, she enthusiastically searched and bought a copy, even though she couldn’t see to read it.) With the letters and other information Thelma provided, her granddaughter wrote her high school paper, and when she read it aloud to her class, it had quite an impact! Thelma and Julie say it’s clear that the rapid blossoming of their friendship is because they have so many things in common, and they became immersed in them immediately. Thelma, who was a clinical social worker as well as owner of the former Easy Going (Berkeley’s beloved travel shop and bookstore), has always been an outgoing “people” person. And Julie, as a longtime (now retired) freelancer reporter for the Jewish Bulletin, Hills Publications, and many more newspapers, loves to talk to people and learn their stories. (With her longtime partner Rudi Raab, she is also the co-author of a recent novel, Stumbling Stone, based on their families’ histories.) And of course the two women’s background similarities are a big part of it all. Thelma sums it up like this. “You don’t have to be told, you just know what ‘village’ your families come from—you’re a landsman [or lansman—roughly, Yiddish for a fellow villager]. There’s a familiarity, and from there, you’re off and running!” Given the many interests Thelma and Julie now share, it was interesting to hear about the first time they met. Thelma asked for an Ashby Village volunteer to help her with only two things—to read her email, and to help her organize her papers. Volunteer Julie Freestone responded to the request. With years of experience as a freelance journalist (now retired), Julie had helped out Ashby Village members on two previous occasions. But this was her first visit to Thelma. She recalls, “I thought, these two requests seem to be combine-able, so I said okay, I’ll do it. I got here and said, okay, what do you want to do first?” Thelma wanted to start with her email. Julie laughs, remembering. “Her email was like a little treasure trove. She had a brisket recipe for Passover, and information from the Jewish Bulletin of Northern California—which I used to work for as a reporter. There were emails about all kinds of political things, the same ones I also got at home, and lots of KQED stuff, and so forth. We found from doing that little exercise that we actually had a lot in common!” After that first hour, Julie assumed they would turn to sorting papers. But Thelma said, “No—now that I know who you are, I have some much more pressing work for you to do.” As it happened, Thelma was about to make an important presentation to the Ashby Village Board the following week. In her typical dynamic style, she had responded to her loss of vision by starting a local support and information group for others with the same loss of vision. Now she wanted to take it a step further by making a presentation to the Ashby Village Board. Julie takes up the tale. “She had six versions of this presentation, but of course she couldn’t see well enough to read them. Because I had told her I had been a reporter, she figured I could help. We both came from families where advocacy was the rule of the day, so this was a perfect match. So I decided to help her. I came back about three days later, and we finished the presentation.” Thelma explains how the group (whose ideas she planned to express to the Board) got started. “When I was first diagnosed with macular degeneration, I searched for resources and couldn’t find any. Macular degeneration is one of the fastest growing health problems for older people. People don’t know what it is, or where to go for help. 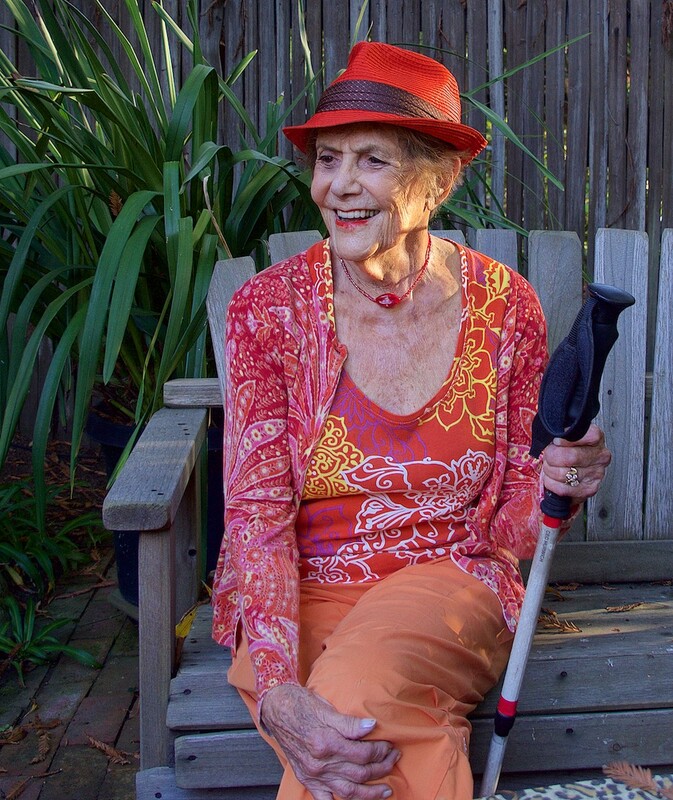 So I and others formed the Ashby Village Macular Degeneration Support Group,” says Thelma. Note: macular degeneration affects more than 10 million Americans—more than cataracts and glaucoma combined. At present, it is considered an incurable eye disease. “In addition to presenting basic information about macular degeneration and the experiences shared by members of my group,” says Thelma, “My pitch to Ashby Village was that since the organization was set up to take care of people in their homes, they should also become active in getting services to go with that, as part of their mission.” The macular degeneration presentation was a great success. No surprise, Thelma was motivated to go on to try to influence wider circles of people. She is now personally active in getting support for legislation that affects people with low vision; an effort with which Julie assists. From the very first meeting it was clear the two enjoyed a special relationship. When Julie called Thelma the next day to tell her how much she had enjoyed their meeting, Thelma told her, “I’ve been telling everybody I talked to today that an angel came to my house.” And how does Julie experience the time she spends with Thelma? “I feel like I’m having a play date when I come over!” Julie says. Sometimes a story is about what’s missing, like building a jigsaw puzzle from the outside inward to discover the center. When Don Foley and Marion Anderson stand side by side, they are both tall, slender, and somewhat formal, at least in the beginning. Cookies and a pitcher of cold water are set out, with introductions made all around. At age 96 when Don joined Ashby Village, he still drove a Toyota and had a valid driver’s license. Independence and automobiles are featured in many of Don’s best memories. He remembers his family’s first car in 1926 – a Willys Whippet – and his excitement when he got his first driver’s license at age 16. So it was not easy for Don to decide the time had come to let his driver’s license expire and to donate his car to KQED. Fortunately the transition from driver to passenger was eased by Ashby Village volunteers. Ashby Village Med-Pal volunteer/member Marion Anderson gave Don his first ride and thereafter drove Don and/or Katharine some 30 rides all carefully recorded. Don finally gave up keeping track of his Ashby Village rides, but estimates he’s gotten another 20 “unrecorded” rides from Marion. Marion laughs that if she is ever audited by the Internal Revenue Service, she will count on Don’s records to document her volunteer work for Ashby Village. In addition to both being somewhat reserved, both have a very practical nature. Discovering they shared the same audiologist, Don and Marion began coordinating their audiology appointments in tandem on the same day at Kaiser Oakland Hearing Center. 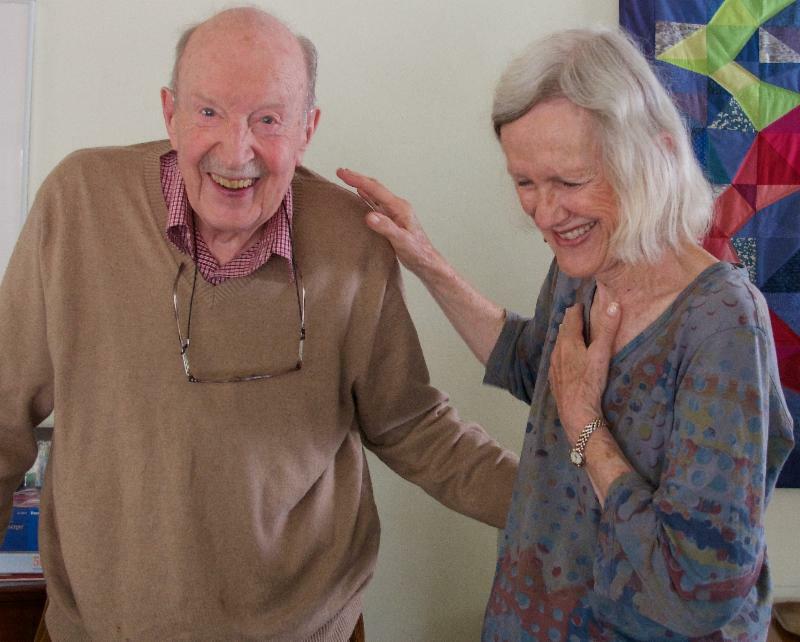 Initially driving Don with his wife Katharine to her medical appointments, Marion continued driving Don alone to his own medical appointments after Katharine’s recent death in January 2015, after 74 years of marriage. On this particular sunny afternoon, reflecting on why he and Marion are so comfortable in each other’s presence, Don says softly “Marion and I have a grief we’re sharing – a quiet respect for what has occurred for both of us.” Marion shares that her partner Ashby Village member Peter Franklin died in October 2013, so the two of them share an unspoken empathy and understanding about what the other is going through after the loss of a loved one. Asking if we have seen the family photographs attached to the refrigerator door, Don draws attention to one showing his wife Katharine playing tennis. He makes sure we know that the fact Katharine beat him at tennis on their first date was one of the things that attracted him to her. He chuckles in telling how his wife Katharine acquired the lifelong nickname “Taddy” from having asked at age five whether she was a tadpole. 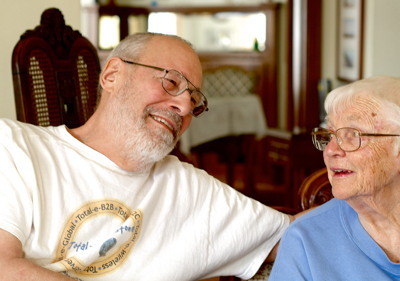 Don is grateful that his wife Katharine’s desire not to have life sustained through extraordinary medical intervention was honored and that she was able to spend her last days in her own home surrounded by loved ones. Following up on Don’s description of Katharine’s last days, Marion comments on how much Marion values Compassion and Choices, which is partnering with Ashby Village to raise awareness about end of life decision-making. She mentions the Mid-landish neighborhood group to which both she and Don belong, is hosting a “Final Exit” lecture/discussion. Throughout the conversation, most of the time Marion listens quietly but closely, responsive to any request that Don makes. She does not interject about herself, unless directly asked. Watching her attentiveness to Don’s needs, it is no surprise to learn her lifework has been focused on the care of others. Other Ashby Village activities Marion enjoys are yoga and lectures. She’s often at the First Friday happy hour. She also enjoys singing with the San Francisco Choral Society, and is on the waiting list to join the Berkeley Community Chorus. Visualizing Marion singing in harmony with others is easy to do. Whatever the subject under discussion, Don has a way of bringing it back to his recently passed wife, as he points to the many things in the living room that were part of their life together, from the quilt hanging behind him that Katharine sewed together from pieces of shirt fabric, to the various displays of artistic photographs taken by Katharine, to the unfinished puzzles on the table where he and Katherine spent hours. Puzzles are one of the ways Don’s methodical approach to problem-solving is evident, as he keeps a ruler handy for measuring progress. The ruler, well placed, also serves as a barrier to keep the puzzle pieces from falling off the edge of the table. Don’s talent at tracking detail has taken many directions including an interest in genealogy. Explaining how he ended up doing a genealogy study on Marion’s family (with the interesting discovery that Marion’s Swedish Mormon grandmother was from Idaho! ), Don pipes up “I was nose-y!” Marion quickly counters firmly that he simply offered, and she was glad to accept. Don’s appreciation for the nuances of how things relate to each other is reflected in his career choices. Don joined the Department of City and Regional Planning on the Berkeley campus in 1953. He then spent 27 rewarding years, retiring in 1979. He mainly worked with students earning the Master of City Planning degree and, later, also with students earning the Ph.D. degree. He and Katharine and some of their children spent 4 wonderful sabbaticals in London. Don produced two books about London planning and London metropolitan government. This month is Don’s 99th birthday. Looking back over his lifetime, Don recalls all the technology “firsts” he has seen: first radio, first telephone, first movie, first sound movie, first television, first computer, and all the changes in cars. Asked how he wants to celebrate his centennial birthday next year, always low key, Don responds “if I’m still here” what he would most enjoy is simply having a family reunion with his three children, eight grandchildren, and five great grandchildren. Asked about cake, he concedes “Cake is good.” What’s his favorite kind of cake? (pause) What about chocolate? “Chocolate will do.” What does matter is that Katharine will not be there. It all started with a pile of magazines. 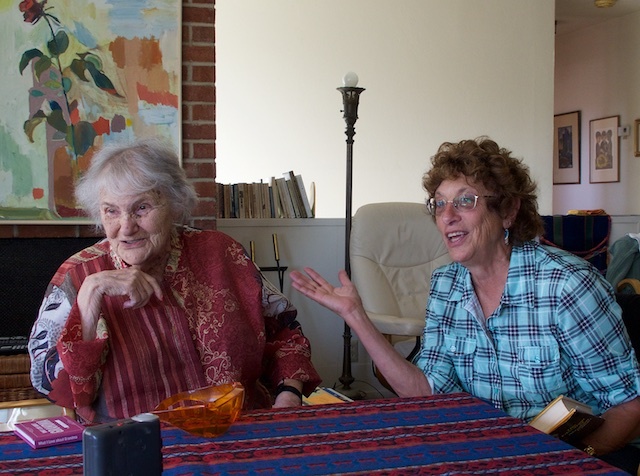 One Tuesday a couple of years ago, Ashby Village volunteer Daniel Sabsay decide to attend a luncheon given at the North Berkeley home of member Dr. Danute Nitecki. Known by all as Dee, she had recently begun hosting lunches for Ashby Village members. Up to ten people gathered around her long dining table for conversation over a delicious home cooked meal. Right away, recalls Daniel, “I said I was interested, and she said maybe I could read to her sometime.” And thus began a mutually satisfying relationship. He continues, “We would read the headlines and negotiate on what articles to read. I would read one article, then we’d decide on one or two more. Sometimes that was after the lunch, and sometimes I’d come over independently of the lunch.” Coming over wasn’t a simple matter. Oakland resident Daniel doesn’t have a car, so it took him about an hour each way, using several forms of public transportation. But he and Dee enjoyed their get-togethers so much that it was well worth it. The two are a study in contrasts, yet they have much in common. Both are strong minded individuals, both have scientific backgrounds, and both are eternally curious about learning. Daniel, originally from Los Angeles, has a degree from UCLA in math and physics. He’s had a long career as a computer programmer, consultant, and information systems and project manager. In addition he has been instrumental in setting up and maintaining the website for Ashby Village. In 1950 the family emigrated to the United States, where she attended the University of Chicago and received her Ph.D. in chemistry in 1961. “My basic background is in chemistry,” Dee tells me. “I worked at UCSF Medical Center for 20 years and did a lot of research in basic immunology—trying to understand how the immune system works. We did some very interesting research. So—invention, skepticism, and science in general are meeting grounds for this pair. As is reading together. “I was happy with reading the science magazines,” recalls Daniel, “but then along came an assignment from Dee’s Chicago book club to read this 650-page tome.” “I’m in two book clubs in Chicago,” Dee explains. “I have belonged to both of them over 30 years.” The book was The Physician, a novel by Noah Gordon. It’s a colorful historical novel that centers on 11th century practice of medicine. Daniel admits, “I would never have picked a book that long. I only read science and science fiction.” But Dee told him, “I have this as a priority, to read this book.” And Dee is a person who, once decided on a course of action, seldom wavers. So Daniel would take the bus over around 2:00 in the afternoon, and read between 50 and 80 pages aloud. He’d read until dinnertime. “To tell you the truth,” he admits, “I loved that book—it was fascinating. And Dee has treated me to lots of nice dinners, too!” While all this was going on, Dee and Daniel embarked on a separate project that Daniel was particularly well qualified to direct. He explains, “She had this old PC that wasn’t really functioning. So I said, ‘Look, what about getting rid of this and getting a new Macintosh?’ She said, ‘Oh, I used to use a Mac, I like that.’ So I spec’d out a system that would work for her, and we got a new Mac going.” There was a training period that went on for quite a while. Much of what Daniel did was to adapt the computer so Dee could use it with her failing vision. Daniel was uniquely qualified to help Dee – for several years he worked for the Disabled Students Program at the University of California, Berkeley, providing assistive technology support. “We did the setup for just about everything—voice recognition, audio playback. I can also dial in and take control of the machine and help her solve problems.” He adds, “There is such great satisfaction in seeing the empowerment that comes with knowing how to operate the computer.” There is one very important pursuit of Dee’s that—although he doesn’t participate—Daniel supports and admires. That is Dee’s painting. 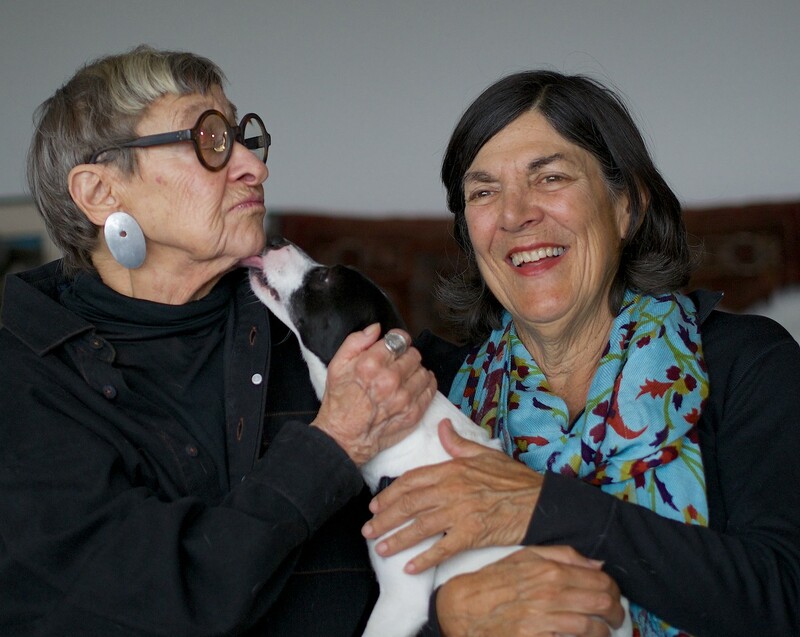 The little black and white dog sits between the two women, gazing adoringly first at one face, then at the other. He tilts up his nose to “kiss” Phyllis, and she gives him a delighted hug. “This is just him, all the time!” she laughs. “Griffin is the most unusual, loving, trusting, friendly, intelligent, sensitive dog.” This little pooch definitely knows how to turn on the charm. “He’s just a wonderful dog,” Enid agrees. “I’m very lucky to have him, and I’m also lucky to have friends who love him too!” she smiles at Phyllis. The pair hit it off from that first encounter. In the first place, both were New York City “expatriates.” Not only that, but they also quickly discovered that they had similar tastes in books, art, and films. Phyllis, a diminutive octogenarian, projects an abundance of energy and spirit. She's full of surprises. During our chat, I asked her about her career and learned that she had been a psychiatric social worker. Then I asked where she had done her most recent work. Her answer: San Quentin State Prison, where she was the first social worker in the Psychiatry Department. Shortly after that first grocery store outing, Enid recalls, Phyllis mentioned how much she loved dogs. “That’s an understatement!” puts in Phyllis, who—it must be revealed—is such a dog lover that she always carries treats in her pocket just in case she encounters a friendly pooch. So, one day when Enid was walking Griffin, she decided to take him over to meet Phyllis. And the rest, as they say, is history. Like Enid, Phyllis fell for Griffin immediately. “He really is better and smarter than the average dog,” she says, with all the pride of a fond aunt or grandmother. And she’s right—there’s something about the little dog that is irresistible. In addition to being pretty darned cute, Griffin is the perfect lap dog. At 12 pounds, he’s just the right size. A half hour into our conversation, he apparently decided I possessed a dog-worthy lap. With surprising power in his stubby little legs, he leaped down from Enid’s lap and sprang onto mine. He even bestowed a sloppy kiss on my cheek. Apparently, he’s as hungry as he is affectionate. “He’s very food oriented,” says Enid. “He sometimes runs across our street to a park, where he knows that the children playing there leave crumbs. He’s very smart—he knows all about treats!” And sure enough, at one point during our visit, Griffin was suddenly not in the room. He had wandered into Phyllis’s bedroom and was sniffing excitedly at the floor under the bed. “He’s probably looking for crumbs!” laughs Phyllis. “We’ve done a lot things together,” adds Enid. “We went to a fascinating talk at the Jewish Museum in San Francisco, as well as a film, a reading at a bookstore, and so forth.” They also just enjoy spending time together, doing very ordinary things like watching television. And of course Enid brings Griffin over for regular visits. In turn, Phyllis helps out Enid by taking in Griffin when Enid, an enthusiastic world traveler, goes on one of her trips. “I love it!” beams Phyllis. Not surprisingly, both women sing the praises of the organization that brought them (and Griffin) together.